One of the most difficult things about our farmhouse was that it was smaller than I had hoped. The old summer kitchen on the property, directly behind the house, gave me hope though. I envisioned it as the perfect little room to homeschool in! 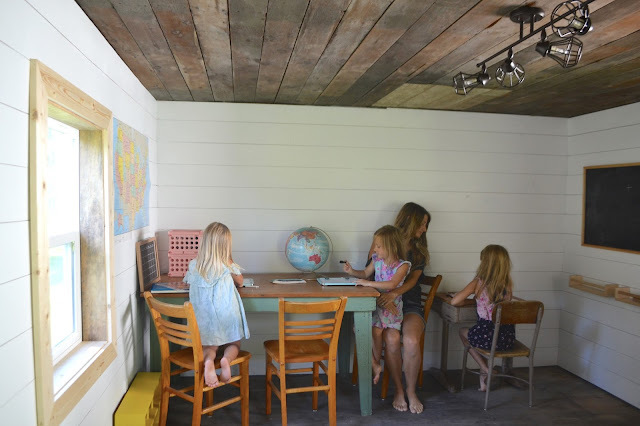 I don't need a huge house, but as a homeschooling mom, and as one who goes crazy in unorganized spaces (as does my husband), I knew a separate space for homeschooling was crucial. Our beautiful homeschool room didn't look like this to begin with, though. We actually finished renovating this space at the end of the summer. I think I have procrastinated writing this post because I plan to paint a sign to hang on our schoolhouse, and it hasn't happened yet... but, I've procrastinated long enough. So I write write the post and hopefully paint a sign for our cottage school this summer. This is the exterior of our summer kitchen turned school house. I love imaging the years this little building was used as a summer kitchen. The summer kitchen looked like this when we bought the farmhouse. It was simply used as a shed in its most recent years. The insulation had years of mouse droppings stored inside, so we tore all of that out. 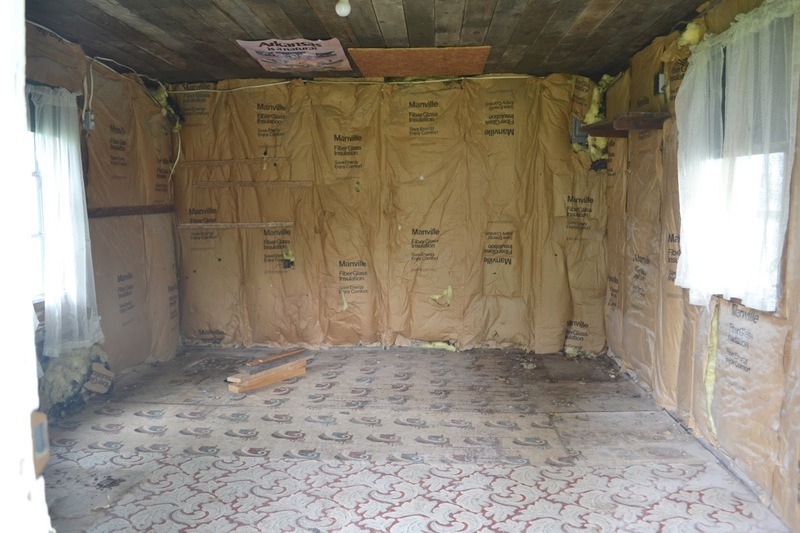 We then installed new insulation, added drywall, and used plywood to created shiplap walls. We left the original ceilings and floors, because, hello! Beautiful! I sure am thankful for this space. It's so nice to be able to keep some of our books in here (because we sure do love books in this house! ), and it's such a fun space. 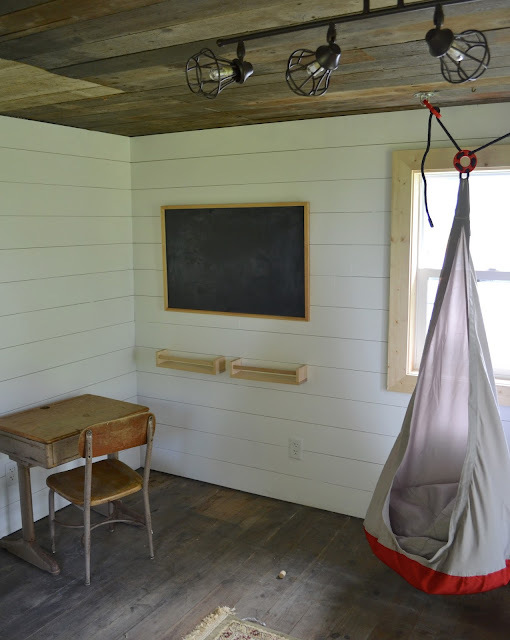 I found an old school clock at a vintage fair, and it fits perfectly in the schoolhouse. I also keep craft items in the school house. People always ask us if we are using the school house during the winter. I really thought we would, but we haven't been. Once it started getting cold, we began doing school inside. In order to do school in the school room, we would have to buy a heater. For now, with just one student, it makes sense to just do school inside. During the warmer months, the younger girls play outside while I do school work with Sophie, but during the colder months, the girls play inside with all of their toys, so it makes sense for me to just be inside with them as well. We do keep many of our school supplies in the school house still, and I just gather what I will need each day. It's incredibly nice to have a separate space for all of our school books and supplies! And we look forward to when it will be warm and we can do school out in this space again. We had animals in the school house every day. Farm schooling at its finest! This is so beautiful! I *love* the character and effort that went into this lovely room. What a sweet space to learn in! My oldest is four so we have some time, but of course I’m already trying to figure out EVERYTHING... mostly, where do we keep all the books? We’re already running out of bookshelves! Our house was built in the 60’s, so very little character and no nooks, just awkwardly long rooms �� ah well, God provides a way! �� Thanks for sharing! Thanks for the sweet comment, Amanda! I'm so very thankful for this space - it's definitely a blessing as we homeschool!